Update: The launch is postponed by one day due to technical reasons, next launch window will be at 19-09-2015 23:00:00 UTC. 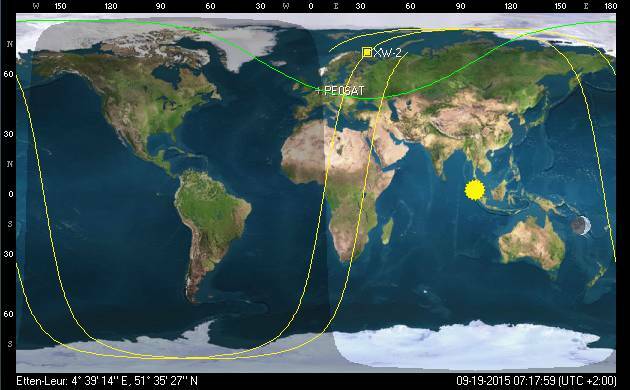 This entry was posted in Launch and tagged CAS-3, XW-2 by PE0SAT. Bookmark the permalink. It seems that the checksum of the first line of your TLE file is erroneous. For me, the line should ends with the number 2 (and not 0). Have you added +1 for the – character ? It looks like not ? I had a similar problem, the one in research.txt seems to solve the check-sum problem. Give it a try and let me know if it also works for you. Same problem with your research.txt. The checksum of the first line of XW-2 is erroneous. The last character of the line must be a “2”, not a zero ! All the others satellite TLE are good but the XW-2 is not OK.
– Keep the unit figure of the result ( x modulo 10). – The 69th character of the line must be equal to this figure. From where did you get this TLE of XW-2 ? 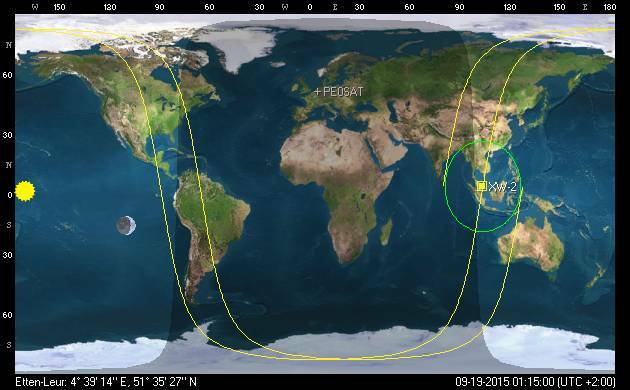 Update: New launch window and new TLE data.